The Focus Formation Assay provides a straightforward method to assess the transforming potential of a candidate oncogene. Alvarez, A., Barisone, G. A., Diaz, E. Focus Formation: A Cell-based Assay to Determine the Oncogenic Potential of a Gene. J. Vis. Exp. (94), e51742, doi:10.3791/51742 (2014). Malignant transformation of cells is typically associated with increased proliferation, loss of contact inhibition, acquisition of anchorage-independent growth potential, and the ability to form tumors in experimental animals1. In NIH 3T3 cells, the Ras signal transduction pathway is known to trigger many of these events, what is known as Ras transformation. The introduction of an overexpressed gene in NIH 3T3 cells may promote morphological transformation and loss of contact inhibition, which can help determine the oncogenic potential of that gene of interest. An assay that provides a straightforward method to assess one aspect of the transforming potential of an oncogene is the Focus Formation Assay (FFA)2. When NIH 3T3 cells divide normally in culture, they do so until they reach a confluent monolayer. However, in the presence of an overexpressed oncogene, these cells can begin to grow in dense, multilayered foci1 that can be visualized and quantified by crystal violet or Hema 3 staining. In this article we describe the FFA protocol with retroviral transduction of the gene of interest into NIH 3T3 cells, and how to quantify the number of foci through staining. Retroviral transduction offers a more efficient method of gene delivery than transfection, and the use of an ecotropic murine retrovirus provides a biosafety control when working with potential human oncogenes. Tumor cells can be distinguished from their normal counterparts by a wide range of alterations, from patterns of gene expression to epigenomics to morphological and proliferative changes. Among the latter, reduced dependence on serum, loss of contact (density) inhibition, the acquisition of anchorage-independent proliferation and, ultimately, the ability to form tumors when injected into animals are useful, measurable indicators of malignant transformation3. Several in vitro and in vivo assays have been developed for cellular transformation. In vitro assays aim at identifying and measuring changes in culture morphology (focus formation assay), culture dynamics (growth rate, saturation density) and growth factor (growth in reduced serum) or anchorage (growth in soft agar) requirements. The gold standard for determining the malignant nature of a cell type remains tumor formation (xenografts) in experimental animals. However, the cost and length of in vivo studies do not always make them justifiable as a first validation step or screening of candidate oncogenes. Although no in vitro assay provides a definite assessment of the oncogenic potential of a gene, they do provide insight into oncogenic potential that may narrow down future in vivo studies. One of the most widely used systems for evaluating oncogenic potential in vitro is the Focus Formation Assay2. This approach relies on the use of NIH 3T3 mouse fibroblast, a non-transformed cell line that shows strong contact inhibition. Overexpression of an oncogene results in loss of density-dependent growth; transformed cells can then grow in multiple layers, forming “foci”, easily visualized against the background monolayer of non-transformed cells. The Focus Formation Assay, then, measures the ability of a candidate oncogene to induce malignant transformation, as evidenced by the loss of contact inhibition as a measurable phenotype. The FFA has been used to evaluate transformation by overexpression of protein kinases (e.g., Src4, BRAF5), transcription factors (e.g., N-myc6), G-protein-coupled receptors (e.g., P2RY87) and GTPases (e.g., Ras1), among others. The relative ease of this assay makes it a good choice that will provide a quick and visually clear answer to whether overexpression of the gene is sufficient to transform NIH 3T3 mouse fibroblast cells in vitro. The FFA described in this protocol uses the Plat-E packaging cell line8, which provides viral packaging proteins, and the retroviral vector pBABEpuro9 (Addgene plasmid 1764) to produce retrovirus. After transfection with the pBABEpuro construct containing the gene of interest, the Plat-E cell line will produce ecotropic retrovirus that can be used to infect NIH 3T3 cells. This viral method of gene delivery is more efficient than traditional chemical transfection methods and it offers a way to sustainably express the gene10. Once incorporated into the genome of the NIH 3T3 cells, overexpression of the gene of interest is driven by the viral long terminal repeats (LTR) promoter11. This constant expression can be used to determine whether the gene of interest has oncogenic activity, as measured by the formation of foci, on the NIH 3T3 cells. The coding sequences for the gene of interest, as well as the positive and negative controls, are inserted into pBABEpuro by traditional cloning methods (PCR amplification, restriction digestion and ligation). There are four restriction sites on the vector where the DNA can be inserted: BamHI, SnaBI, EcoRI and SalI. Prepare transfection-grade plasmid DNA from competent cells using the QIAGEN plasmid midi kit. Measure DNA concentration using a NanoDrop2000 spectrophotometer. The Plat-E packaging cell line will be used to produce ecotropic retrovirus that will deliver the cDNA of interest to NIH 3T3 cells. Quickly thaw Plat-E cells in a 37 °C water bath and transfer to a 15 ml conical tube. Slowly add 9 ml of Plat-E medium (Dulbecco’s Modified Eagle Medium (DMEM) + 10% Fetal Bovine Serum (FBS) + Penicillin and Streptomycin). Centrifuge the tube at 180 x g for 5 min and discard the supernatant. Re-suspend the cells with 10 ml of Plat-E medium and transfer to a 10 cm culture dish. Incubate the cells in a 37 °C, 5% CO2 incubator until they are 80-90% confluent (about 2 days). Aspirate the medium and wash cells once with PBS. Add 2 ml of 0.05% trypsin-EDTA and incubate for 1 min at RT. Detach the cells by finger tapping, add 10 ml of Plat-E medium, and transfer the cell suspension to a 15 ml tube. Resuspend the cells with 10 ml of Plat-E medium and seed them in new dishes at 1:4-1:6 dilutions. Seed 2 x 106 cells per 10 cm culture dish using Plat-E medium without any antibiotics. Incubate the cells O/N in a 37 °C, 5% CO2 incubator. Next day, transfer 300 μl of Opti-MEM into 1.5 ml microfuge tube. Add 27 μl of polyethylenimine (PEI), a cost-effective transfection reagent12, to the prepared tube with Opti-MEM. Mix gently by finger tapping and incubate for 5 min at RT. Add 9 μg of transfection-grade plasmid DNA into the Opti-MEM/PEI tube, mix gently by vortexing, and incubate for 15 min at RT. Add the DNA/PEI complex drop-wise into the Plat-E dish, and incubate O/N at 37 °C, 5% CO2. Next day, aspirate the medium containing the transfection reagent and add 10 ml of fresh Plat-E medium (without antibiotics). Return the cells to the incubator. Quickly thaw NIH 3T3 cells in a 37 °C water bath and transfer to a 15 ml tube. Slowly add 9 ml of NIH 3T3 medium (DMEM + 10% FBS). Resuspend the cells with 10 ml of NIH 3T3 medium and transfer to a 10 cm culture dish. Incubate the cells in a 37 °C, 5% CO2 incubator. It is very important that NIH 3T3 cells are always kept underconfluent (50-60%), as the frequency of spontaneous transformation (and therefore basal levels of foci formation) increases once a culture reaches confluency. Seed 3 x 105 cells per 10 cm dish and incubate O/N for infection the next day. Harvest the retroviral supernatant from the Plat-E dish by using a 10 ml disposable syringe, filtering it through a 0.45 μm pore size nylon membrane filter, and transferring it into a 15 ml tube. Add 10 ml of fresh Plat-E medium to the cells (without antibiotics), and return them to the incubator. Aspirate the medium from the NIH 3T3 cell dish to be infected, and add 5 ml of regular NIH 3T3 medium and 5 ml of virus-containing filtered supernatant. Add polybrene to the dish at a concentration of 6 μg/ml. Incubate the cells O/N at 37 °C, 5% CO2. Next day, repeat steps 3.2.1 – 3.2.5 for a second round of infection. Replace the virus-containing medium with regular NIH 3T3 medium. Allow the NIH 3T3 cells to grow for 2-3 weeks, replacing the medium as necessary. Check expression of the protein of interest by conventional protein electrophoresis and immunoblot on whole cell lysates from replica plates. Aspirate the NIH 3T3 medium and place the dishes on ice. Wash the dishes twice with ice-cold PBS. Fix the cells with ice-cold methanol for 10 min. Remove the dishes from ice, aspirate the methanol, and add 3 ml of 0.5% crystal violet solution made in 25% methanol (RT). Incubate the dishes for 5 min at RT. Aspirate the crystal violet solution and carefully rinse the dish with Milli-Q H2O until no color comes off in the rinse. Allow the dishes to dry O/N on a benchtop (uncovered). Once the dishes are dry, use a ruler to measure the darkly colored collections of cells on the plate. Only count those that are greater than 5 mm in diameter as “foci.” Record the number of foci and calculate averages and the significance compared to the controls. MXD3 is a basic helix-loop-helix leucine zipper (bHLHZ) transcription factor that is a member of the MYC/MAX/MAD network. It is an atypical member of the MAD family13-15, and it has been reported to be involved in carcinogenesis16,17. When compared to pBABEpuro (negative control) and MYC (positive control), the NIH 3T3 dishes where MXD3 was overexpressed had significantly less foci (Figure 1A). The data in Figure 1B were collected from multiple experiments to determine significance. There was initial interest in determining MXD3’s oncogenic potential because it has similar activity to MYC (the known oncogene). However, results from this assay suggest that MXD3 does not function as an oncogene. Figure 1. Focus formation assay results. The oncogenic potential of MXD3 was determined by focus formation assay (FFA) in NIH 3T3 cells. (A) Images of cells from a single experiment stained with Hema 3. Note: Crystal Violet may be used as an alternative stain. (B) Combined results from three experiments. All experiments were performed in duplicate. Focus counts for each experiment are as follows: Experiment #1: pBABEpuro (13, 11), MXD3 (3, 4), MYCN (23, 19); Experiment #2: pBABEpuro (8, 7), MXD3 (1, 0), MYCN (22, 20); Experiment #3: pBABEpuro (9, 20), MXD3 (3, 0), MYCN (21, 12). Error bars represent standard deviation of number of foci across the three experiments. Significance: ** p < 0.01; *** p < 0.001. Please click here to view a larger version of this figure. The FFA provides a quick and easy method to evaluate malignant transformation in vitro. It is amenable to screening of a relatively large number of candidate genes, and its modest technical requirements make it cost-effective. Furthermore, two or more genes can be coexpressed (sometimes referred to as a “cooperation” assay) to evaluate the tumorigenic potential of the combination. The advantages of this assay rely on its straightforward technique, its ease of quantification and its relatively short turn-around time. It must be emphasized, however, that it does pose the limitations of all in vitro assays. The assay evaluates oncogenic transformation by measuring one phenotypic characteristic of cancerous cells, namely, their ability to grow beyond a monolayer in a culture dish. Negative results, therefore, should be interpreted with caution, as a particular oncogene may induce transformation without promoting this particular phenotype or may require coexpression with another gene (i.e., cooperation mentioned above). In this case, it is recommended to assess transformation by other in vitro methods, such as determination of proliferation rate and serum requirements and/or anchorage independent growth by, for example, the soft agar assay. Although the FFA technique is straightforward, several conditions must be observed. Most importantly, it is critical to use a subclone of 3T3 cells that shows very low spontaneous transformation. Being pre-neoplasic (a feature that makes this cell line very sensitive for this assay), certain vials may contain a significant number of already transformed cells, resulting in unacceptably high basal levels for the assay. To minimize spontaneous transformation it is very important that the starting culture is obtained from a reputable source. In addition, cells should be subcultured at regular intervals and never allowed to reach confluency. We recommend passing cultures when they reach approximately 50% confluency. For this reason, it is important to create additional constructs to use as controls. In our experiments, we used pBABEpuro containing MYC (a known oncogene)18 and empty pBABEpuro to serve as the positive and negative control, respectively. The construct of interest can be introduced into the 3T3 cells using a variety of methods; most commonly, traditional transfection methods have been used. In the protocol presented here, the use of viral transduction provides a reliable, efficient and consistent method of gene delivery. Furthermore, the use of ecotropic retrovirus makes this assay relatively safe when handling potential oncogenic constructs; however, proper biosafety precautions should of course be followed. When conducting the above protocol, replica plate experiments should be performed in order to both stain and harvest cells from those plates. The harvested cells can then be used to confirm overexpression of the gene-of-interest by immunoblot. Although viral gene delivery presents several advantages when compared to transformation, it should be noted that it does present some disadvantages as well, and many labs still use standard transformation protocols. Viral transduction may not be suitable when strong overexpression is needed; on the other hand, the physiological relevance of very high levels of expression achieved by plasmid transfection could be questionable. Finally, it should be emphasized that a second assay is usually required to verify that the foci are due to oncogenic transformation. Foci can be picked (before staining) and grown in soft-agar to confirm anchorage-independent proliferation. This work was supported by a grant from the NIH Director's New Innovator Award Program (E.D.). A. A. was supported in part by undergraduate awards from the National Cancer Institute and the National Science Foundation. Clark, G. J., Cox, A. D., Graham, S. M., Der, C. J. Biological assays for Ras transformation. Methods in enzymology. 255-395 (1995). Celis, J. E. Cell biology : a laboratory handbook. 3rd edn, Elsevier Academic. 345-352 (2006). Raptis, L., Vultur, A. Neoplastic transformation assays. Methods in molecular biology. 165, 151-164 (2001). Johnson, P. J., Coussens, P. M., Danko, A. V., Shalloway, D. Overexpressed pp60c-src can induce focus formation without complete transformation of NIH 3T3 cells. Molecular and cellular biology. 5, 1073-1083 (1985). Bonner, T. I., Kerby, S. B., Sutrave, P., Gunnell, M. A., Mark, G., Rapp, U. R. Structure and biological activity of human homologs of the raf/mil oncogene. IMolecular and cellular biology. 5, 71400-71407 (1985). Yancopoulos, G. D., et al. N-myc can cooperate with ras to transform normal cells in culture. Proceedings of the National Academy of Sciences of the United States of America. 82, 5455-5459 (1985). Fujiwara, S., et al. Transforming activity of purinergic receptor P2Y, G protein coupled, 8 revealed by retroviral expression screening. Leukemia & lymphoma. 48, 978-986 (2007). Morita, S., Kojima, T., Kitamura, T. Plat-E: an efficient and stable system for transient packaging of retroviruses. Gene. 7, 1063-1066 (2000). Morgenstern, J. P., Land, H. Advanced mammalian gene transfer: high titre retroviral vectors with multiple drug selection markers and a complementary helper-free packaging cell line. Nucleic acids research. 18, 3587-3596 (1990). Kim, T. K., Eberwine, J. H. Mammalian cell transfection: the present and the future. Analytical and bioanalytical chemistry. 397, 3173-3178 (2010). Klaver, B., Berkhout, B. Comparison of 5' and 3' long terminal repeat promoter function in human immunodeficiency virus. Journal of virology. 68, 3830-3840 (1994). Fukumoto, Y., et al. Cost-effective gene transfection by DNA compaction at pH 4.0 using acidified, long shelf-life polyethylenimine. Cytotechnology. 62, 73-82 (2010). Fox, E. J., Wright, S. C. S-phase-specific expression of the Mad3 gene in proliferating and differentiating cells. The Biochemical journal. 359, 361-367 (2001). Yun, J. S., Rust, J. M., Ishimaru, T., Diaz, E. A novel role of the Mad family member Mad3 in cerebellar granule neuron precursor proliferation. Molecular and cellular biology. 27, 8178-8189 (2007). Gore, Y., Lantner, F., Hart, G., Shachar, I. Mad3 negatively regulates B cell differentiation in the spleen by inducing Id2 expression. Molecular biology of the cell. 21, 1864-1871 (2010). Barisone, G. A., Yun, J. S., Diaz, E. From cerebellar proliferation to tumorigenesis: new insights into the role of Mad3. Cell cycle. 7, 423-427 (2008). Barisone, G. A., et al. 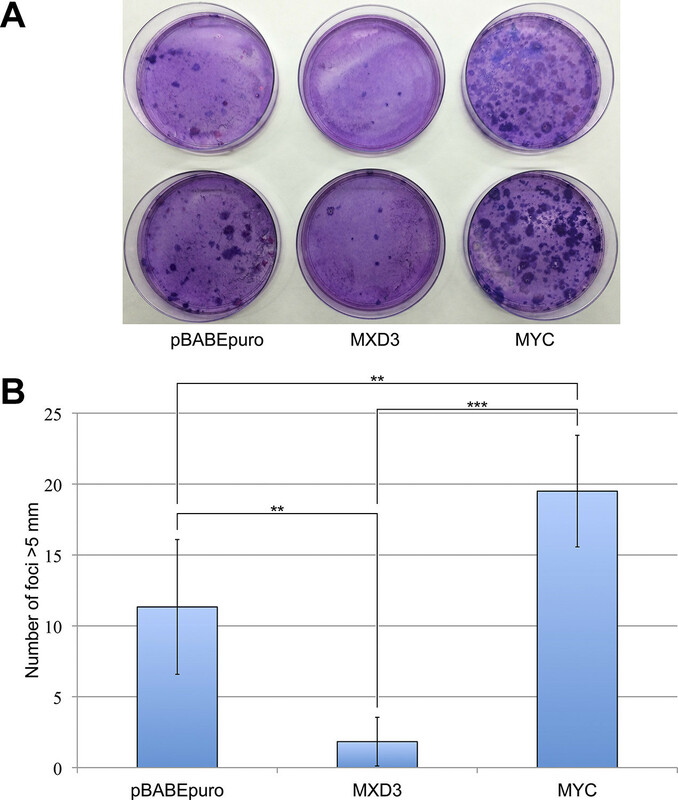 Role of MXD3 in proliferation of DAOY human medulloblastoma cells. PloS One. 7, e38508 (2012). Nair, S. K., Burley, S. K. X-ray structures of Myc-Max and Mad-Max recognizing DNA. Molecular bases of regulation by proto-oncogenic transcription factors. Cell. 112, 193-205 (2003).